8 Crystal Tall Tea/Water Goblet Glasses. Only one owner and were not used a lot. Excellent condition with no chips or cloudiness. Glasses measure 8 inches tall, 6 inches deep, 3 inches across rim and they hold 12 ounces. Svend Jensen crystal glassware! Made in Poland. Excellent preowned condition! Original labels on glassware.one label in slightly used condition_. 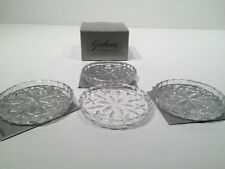 Gorham Lady Anne Old Fashioned Glasses Tumbler Set of 4 Style CB4014 Germany New. Shipped with USPS Parcel Select Ground. Vintage set 4 Crystal Multi Colored Iridescent Cordials /Sm Champagne Austrian. Condition is Used. Shipped with USPS Priority Mail. 4 never used quality crystal signed Ralph Lauren highball beverage glasses tumblers. Perfect condition. 6 1/4” x 2 3/4”. On any one item. Our photos are taken using a photo booth with a high quality cell phone and are not altered by wizard or programs. Condition: New, never used. Original box has shelf wear. 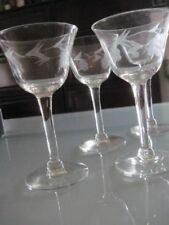 New Listing8 GORHAM WINE GLASSES LADY ANNE PATTERN PRISTINE!!! FOR YOUR CONSIDERATION I HAVE ALL THESE FANTASTIC GORHAM CRYSTAL GLASS STEMS. ALL SIGNED ON BOTTOMS. 8 WINE GLASSES. 8 WINE GLASSES ALL MINT. ALL ARE IN MINT CONDITION. All 6 in very good condition. 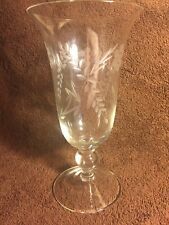 Stuart Crystal Madison Water Goblet. Price listed is for one water goblet. Stuart sticker. NEVER USED! The item(s) in the scan are the ones you will receive. A set of two 8 1/4" water stems by Royal Doulton in theWellesley pattern. Wedgwood Vera Wang Crystal Duchesse Double Old Fashioneds. Three total. The price is for all three. They are 4 3/8" tall. UP FOR SALE SET OF 6 CRYSTAL FOOTED WINE GLASSES. EXCELLENT CONDITION. Each Goblet holds 10 1/4 oz. I have (5) pairs of these Goblets available. 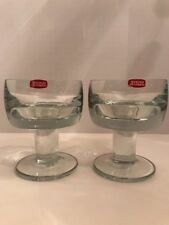 SET/4 CRYSTAL WINE / WATER GLASSES BEAUTIFUL! SET/4 CRYSTAL WINE / WATER GLASSES. 6" H. BEAUTIFUL! ROGASKA CRYSTAL "GALLIA" WATER GOBLET, WINE GLASS. 4 Portmeirion Green Ball Stem Laurel Leaf Cut Iced Tea Beverage Glasses. 7 1/8” x 3 1/8”. No chips, cracks or cloudiness. Hard to find! GORHAM Reizart Prelude Bavarian Hand-Blown Champagne Tall Sherbet Platinum Trim! 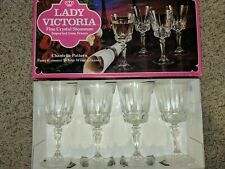 8 GORHAM WINE GLASSES LADY ANNE PATTERN PRISTINE!! !